I know, the letter 'E' is supposed to be for elephant.And it would apply very well to my family. We don't like to forget anything and most of the time we do more of a 'forgive but not forget' action. So I'm changing to 'E' is for Eraser. Most of the time I'm happy to pull out a cute smiley face and erase a tiny hurt caused by someone. Everyone has moments when things are said, meaning to be funny or not knowing they have touched a live wire in your body. If you work with others, are a mom, or a wife sometimes you have to pull out a package of these things to erase the everyday, 'wish that hadn't happened' moments. And then there are those wounds that need the extra heavy duty industrial strength remover. Often it has to be used more than once because the marks still remains. It maybe close to invisible but it's still there. When I get to that point and I can't get that 'thing' erased and I want to drag out the 'elephant' and remember I know it's time for me to hit my knees. That's when I thank God that He has erased my mistakes so cleanly they can't be seen at all. Then I ask to help me erase the hurts from my mind caused by others. For more a2z go to Patty Wysong's blog. Oh, if only it were that easy to remove our goofs! Love the photos- so colorful and cheerful. Very fitting! Sometimes it's easier to "erase" other folks' goofs. Mine seem to be written in indelible ink. Then I have to remember that the One with the ultimate eraser took care of all that. Sharpie comes to mind when I think about my mistakes. Maybe I should use whiteout for W.
Great reminder of the need for those erasers(but NOT for exclamation points, right? LOL). Great one! Love this post, Diana! I'll never look at an eraser the same way again! Forgiving and forgetting brings so much peace--but it sure isn't easy to do. Hugs! I love this! An eraser is such a great symbol of forgiveness. Great post. I'm glad God forgives and forgets so much more easily than we do. I need a mega eraser for my life! "That's when I thank God that He has erased my mistakes so cleanly they can't be seen at all. Then I ask to help me erase the hurts from my mind caused by others"--as stated by the amazing Diana!! I couldn't have said it any better or clearer, Diana. Thanks for the gentle reminder of how much God loves me, loves us all. Great thoughts! I like thinking of using an eraser to help ease others after hard times. 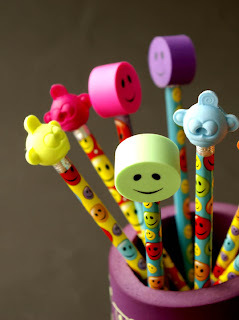 Ooops, I meant to say I also really liked Niki's thoughts on different kinds of erasers for different situations. I'm so very thankful for God erasing my sins! Your blog is wonderful and the post is right on. 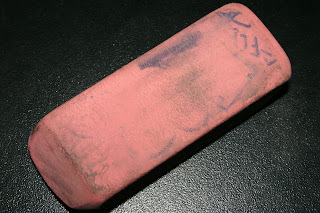 An eraser is so much better than white out that would merely cover up, rather than remove the forgiven spots.